Goodreads Summary: In the court of King Henry VIII, nothing is free — and love comes at the highest price of all. When Kitty Tylney’s best friend, Catherine Howard, worms her way into King Henry VIII’s heart and brings Kitty to court, she’s thrust into a world filled with fabulous gowns, sparkling jewels, and elegant parties. No longer stuck in Cat’s shadow, Kitty’s now caught between two men—the object of her affection and the object of her desire. But court is also full of secrets, lies, and sordid affairs, and as Kitty witnesses Cat’s meteoric rise and fall as queen, she must figure out how to keep being a good friend when the price of telling the truth could literally be her head. I love historical fiction, especially books about England's Tudor period. I was particularly excited about this book because it looks at someone other than Anne Boleyn. While reading, I truly was transported to the court of Henry VII and caught up in the gossip, scandals, and flirtations that come with life at court. Kitty Tylney has always been a "lady-in-waiting" to her best friend Catherine Howard, the "Queen of Misrule." Living away from home while their fathers try to make advantageous matches, Kitty and Catherine plot and scheme about how they can make their way to court. And then one day, their dreams come true. Catherine catches the eye of Henry VIII and is taken to court to be his new wife. Before long, summons also come for Kitty and two of their other friends. At first it seems like old times, but tensions run high at court and secrets are rampant. And no matter how much Catherine might try, she cannot always escape her past. When Catherine starts to fall out of favor at court, what will happen to Kitty? And will Kitty ever have a life of her own? The thing with historical fiction books is that you already know the ending. However, this book was an exception, because this book was not about Catherine Howard, it was about Kitty Tylney. 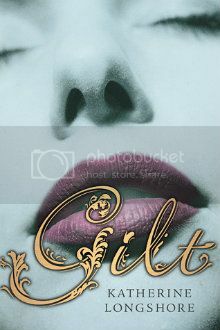 Gilt is a classic example of a book in which characters come to life. Cat and her life dominated the story. In many ways Cat drove me crazy, infuriated me, and made me want to smack sense into her. At the same time, though, I kept rooting for Kitty. I wanted to see her find her own happiness, and I loved that she was willing to keep trying despite everything that happened to her. I enjoyed some of the games and the glamour of life at court, but underneath that not much was sunshine and roses. There is an underlying element of fear to everything Kitty does, and that kept this from being a completely easy read. For most of this book, I was whisked away to Tudor England. I found most of the writing style and dialogue to give the sense of the past without being overly stuffy or formal. A few phrases were anachronistic, but for the most part everything was consistent. The descriptions are wonderful, and the romantic interests for Kitty certainly spice up the story. I definitely enjoyed this debut novel from Katherine Longshore. If you are not fans of historical fiction, I do know of several people who don't typically read this genre and still enjoyed Gilt, so don't let that put you off. I will look forward to reading more from Longshore in the future! I'm glad I'm not the only one that looks for language that is out of place, especially in historicals. I have heard wonderful tings about this book!